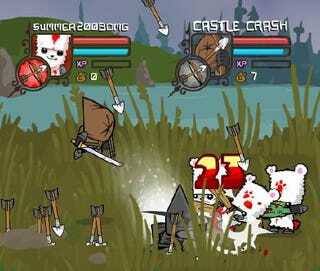 Castle Crashers for XBLA "Completely Completed"
The cartoony multiplayer side-scrolling brawler, promising one of the deepest gameplay experiences of any Xbox Live Arcade game, is finished. So says developer The Behemoth on its official dev blog. No release date as of yet - it will take "a couple months at the very least" to finish QA, certification XBLA bureaucracy, etc. etc. Behemoth posted some new screenshots, and says the devblog will update with more character profiles even though the game's finished. Any guess what the points cost for this thing will be?